Dungeons & Dragons has been one of my favorite games for over 15 years and the game itself has captured the minds and hearts of fans for over 40 years. The Monster Manual is one of the earliest books that TSR (now owned by Wizards of the Coast) released and it is integral for any Dungeon Master (DM) that wants to utilize a bevy of beasties for their game. The important stats are present in the Monster Manual including hit points, size, weight, and special attacks that they possess. The art for what the monsters look like provide important visual cues while the book itself is a solid glossy hardcover that allows complete immersion in the D&D world. It is important enough to purchase the Dungeon Master’s Guide and the Player’s Handbook but another early buy should be the Monster Manual. 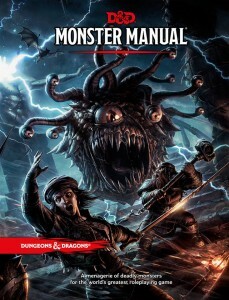 The versatility of the Monster Manual is substantial as players that wish to see whom they are fighting or Dungeon Masters looking to put some spice into their campaign will both equally pick the title up. The Monster Manual can be purchased at a wide variety of the local gaming stores and will cost around $40. Make sure to purchase this edition of the Monster Manual for the latest edition’s information and changes.